The nation’s seaports are strong economic drivers in the United States today, even more so because of the rise of e-commerce and the coming of larger and larger ships into the largest and busiest ports on both the east and west coasts. According to a report by the American Association of Port Authorities (AAPA), “The National Economic Impact of the U.S. Coastal Port System”, there is $4.6 trillion in economic value at the country’s coastal ports. The AAPA report found that a total of $321 billion of total federal, state, and local taxes were generated by maritime activity at the coastal ports in 2014, including $41 billion of direct, induced and indirect federal, state and local tax revenue, and an additional $280.1 billion of federal, state and local tax revenue, which were created as a result of the economic activity of the exporters and importers using the nation’s port system. A 2018 market report on the ports of New Jersey and New York by Cushman and Wakefield, a global real estate services firm, found that a major driver of demand – imports – increased 7.6 percent in 2017, and represented 63 percent of all loaded cargo volume in 2017 for the top 13 ports in the U.S. This growth trend has created a scenario where too much of a good thing has caused issues with traffic into some of these ports. A Federal Maritime Commission annual update report from 2015 found that, at one point in 2015, there were twenty ships anchored off the coast of the Ports of Los Angeles and Long Beach, fourteen ships waiting off the coast of the Port of Oakland, and seven ships off the coast of the Ports of Seattle and Tacoma. During that same year, there was a dramatic increase in container volumes at the Port of Prince Rupert and Port Metro Vancouver on the west coast of Canada, and Port Lázaro Cárdenas on the west coast of Mexico. At the same time, 2015 saw a decrease in container volumes at the Ports of Los Angeles, Long Beach, and Oakland as cargo ships carrying goods bound for the U.S. were diverted to foreign ports. Overall, the United States lost market share in the North American container trade as both Mexico and Canada gained market share. The Commission reported that, once the congestion on the west coast subsided and the vessels waiting outside port could make call, west coast U.S. ports experienced growth for consecutive months to close out 2015, with growth continuing through the first quarter of 2016. West coast ports have been taking steps to ensure that this congestion won’t happen again. For example, massive infrastructure improvement and expansion projects are underway to ensure ports can handle the increase in cargo volume due to mega ships, and super post Panamax cranes are being installed along the west coast to move more twenty-foot equivalent units (or TEU, the size of a standard cargo container) than ever before. The Commission report added that, to compete with rapidly modernizing Canadian and Mexican ports, U.S. west coast ports are going through large expansion projects. The Los Angeles/Long Beach port complex is in the middle of a 10-year, $7 billion investment plan to rebuild marine terminals, raise cranes to accommodate mega ships, update terminal operations through automation and expand intermodal rail access. Managers of the Port of Los Angeles are now working with a $1.17 billion budget for 2016 and 2017 to continue port improvements. The Port of Long Beach has recently completed Phase I of its $4 billion Middle Harbor expansion, providing the terminal with full-automation and super post Panamax cranes capable of handling 20,000+ TEU vessels. Phase II of the terminal is on-schedule for 2019. In April of this year, the Northwest Seaport Alliance, composed of ports in Seattle and Tacoma, approved $141 million for terminal upgrades. Plans for the terminal include expansion and the installation of super post Panamax cranes at Husky Terminal in Tacoma. According to the Commission’s report, the Tacoma’s Husky Terminal will receive reconstruction of Pier 4 that will line it up with Pier 3 to establish a continuous 2,960-foot berth. Both Seattle and Tacoma have major terminal modernization projects underway that will provide improvements, allowing the port to handle larger ships, including having the right number and size cranes, enough container yard space, plus an efficient road, rail, and gate complex. The Cushman Wakefield 2018 market report found that the Port of New York and New Jersey is expected to remain one of the top ports in the country, in part as a result of a new record set in 2017, with 6.7 million TEUs handled, up 7.3 percent from 2016. The coming surge in cargo has created a need to upgrade the infrastructure in and around the port. The Port Authority of New York and New Jersey (PANY-NJ), with the U.S. Army Corps of Engineers, recently completed the $2.1 billion dredging of the New York-New Jersey channel to 50-foot depth. Since 2013, the PANY-NJ has been undertaking a navigational clearance project to raise the Bayonne Bridge from the original 151 feet to 215 feet over the Kill Van Kull strait, which connects Bayonne, N.J. with Staten Island, N.Y. The new elevated roadway opened to vehicular traffic in early 2017, and navigational clearance for larger container vessels was granted in mid-2017. Beth Rooney, manager of port security for the Port of New York and New Jersey, says that the PANY-NJ has invested $600 million in their rail network, and also invested heavily in the widening of and capacity of their roadways to handle the increase in volume of cargo that the port is handling. PORT of Davisville showing both pier 1 and 2. 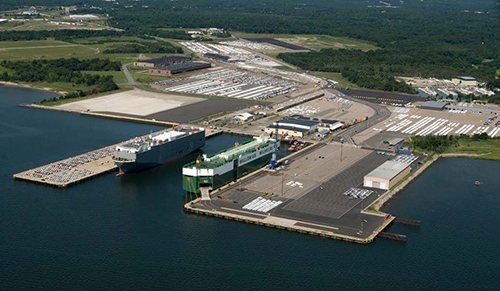 Another east coast port, the Port of Davisville in Rhode Island, managed by Quonset Development Corporation, handles mostly automobile and truck cargo. Last year, the port handled over 220,000 cars and over 200 ships in its two piers. “We are positioned to continue to grow to capitalize on capacity restraints in other ports,” Bob Blackburn, director of the Port of Davisville, says. The U.S. seaports are transitioning to try to keep up with demand for services. But the U.S. Department of Commerce is seeking public input to improve the efficiency and competitiveness of the seaports. The Maritime Commission reported that the Department of Commerce has requested all interested parties provide input via internet or mail regarding several questions, including: what are the most important challenges and opportunities facing U.S. port-related operations and efficiency; what federal policies could be modernized to promote port- related investment and performance; how the federal government can best collaborate with port stakeholders; what are the best practices for improving port-related operations; among others. 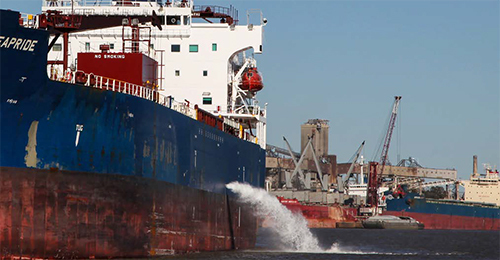 Port of South Louisiana’s performance demonstrates the strength and stability of its resident industry. 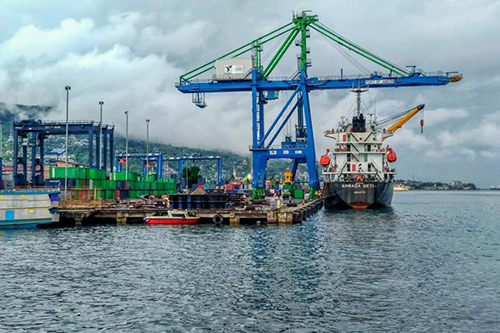 The Port continues on its mission to promote maritime commerce, trade, and development and establish industrial facilities thereby creating jobs and a stronger tax base. Located within a 54-mile stretch of the lower Mississippi River between New Orleans and Baton Rouge, the Port of South Louisiana offers shippers a strategic location at the intersection of the Mississippi River and the Gulf of Mexico and an intermodal transportation network of waterways, roadways, rail, and air, featuring access to four interstate highways, four Class I railroads, the Louis Armstrong International Airport and the Port of South Louisiana Executive Regional Airport. As the largest tonnage port in the Western Hemisphere (307 million short tons in 2017), the Port of South Louisiana is not only the highest grain exporter in the United States (over 50 percent of the nation’s grain is exported via the Port of South Louisiana), it is also the highest ranked exporter in North America. With over 56 million short tons of crude oil imports per year, four major oil refineries, and 11 petrochemical manufacturing facilities, the Port of South Louisiana has been ranked the #2 energy transfer port in the nation. The Port also operates the second-most active Foreign Trade Zones (#124) in the country. With 15 zones, it received over $39 billion in merchandise and facilitated the employment of over 6,200 in 2016. Region, and its labor force. 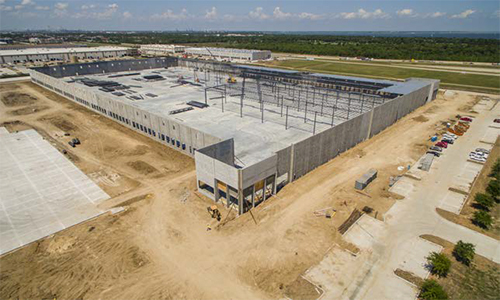 Numerous new large distribution centers throughout the Port Houston region have recently opened or broken ground. Long overlooked for Dallas, Houston is becoming more of a hub for distribution activity. In 2017, IKEA opened a large facility and others are either working on facilities or shopping the Houston area for warehouse space. Given the growth, Port Houston’s leadership has focused intently on infrastructure improvements in recent years, including both landside and waterside improvements. New super post-Panamax wharf cranes are in place at the Barbours Cut Container Terminal, with more scheduled for delivery later this year. Similar cranes are under construction and scheduled for delivery this year at the Bayport Container Terminal. Largely, the port itself is the draw for distribution centers. A longtime significant economic engine for the region with a statewide and national reach, the port is anchored by the Houston Ship Channel, an industrial waterway more than a century old that is home to some of the biggest companies in the world that make up the nation’s largest petrochemical complex. Having a distribution center near the port, which is experiencing organic growth in addition to the anticipated growth in resin export, makes sense. Another contributing factor is the population growth in Texas and the Houston region. Big-Box distributors can reach 50% of the population of Texas within 3 to 4 hours trucking time. The southeast submarket, which includes the port, was responsible for 34 percent of absorption gains and 23 percent of total leasing activity in Houston last year, according to NAI. That is considerably higher than any other sector in the region. The new plastic resins manufacturers coming on line in 2018 will increase demand for packaging capacity and will likely have a positive impact on the warehouse market. Logistics-oriented cross dock distribution centers will also do well as more e-commerce related products arrive at the Port from numerous overseas shippers. Shippers are attracted to the port in part because of the quality of its infrastructure and its innovation and customer service, State-of-the-art truck gates are in use at Port Houston’s terminals to increase the efficiency of the supply chain and to reduce truck turn times and emissions.